Russian fighter plane Yakovlev Yak-7. Line up of late-built Yakovlev Yak-7DI fighters for a propaganda scene. However, only a handful was built and its doubtful if they reached front line units. But they can be considered as the forerunners of the new generation of Yakovlev fighters, the Yak-9 . The Yak-7 is an excellent example how the demands of a war situation can alter the development of an aircraft. In late 1939 Aleksandr Yakovlev initiated the study of a two-seat trainer variant of his Yak-1 fighter. Feeling that a pupil should graduate from the low powered UT-2 trainer to a UTI-26 tow-seat trainer and then into a combat aircraft, which after allowing for sufficient familiarization time at each level, should keep the number of training accidents comparatively low. The only differences from the single seat fighter was the installation of a second cockpit with full dual controls for the instructor, an enlarged vertical tail, installation of a landing light, an increased wing span to 33 ft 7.5 inches, a single hub mounted 20-mm cannon as the sole weapon. The undercarriage was not retractable. The prototype flew for the first time during late summer of 1940 with State Acceptance trials of the UTI-26 trainer proceeding in parallel with the fighter type, with production also being at the GAZ 115 factory (Moscow). The surprise attack by Germany forced the Yakovlev Design Bureau to convert the UTI-26 into a combat aircraft. Since fighters were so desperately needed at the front any available aircraft that could be used as a fighter were ordered armed and into combat. The designation of the Yakovlev trainer was changed from UTI-26 to Yak-7. 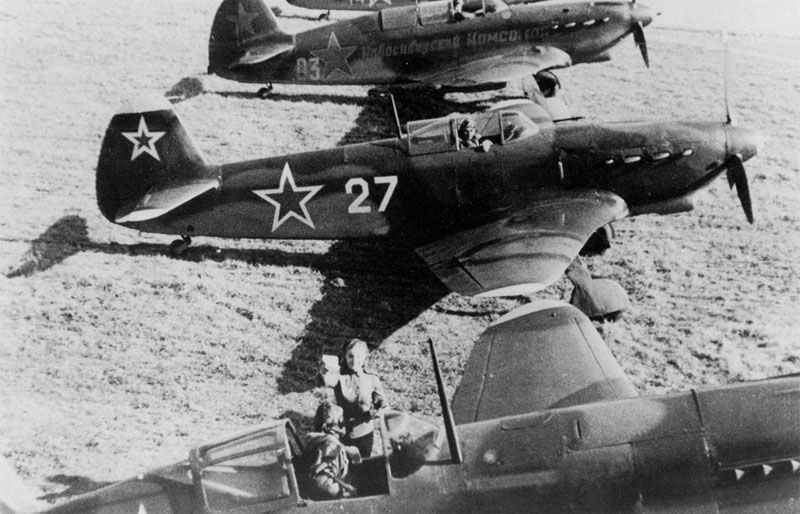 Under the designation Yak-7A the first two-seat fighters reached frontline units during late 1941. Armed with a 20-mm ShVAK cannon and two 12,7-mm Berezin UB machine guns with 300 rounds each. Provision was also made for six RS-82 rockets or a pair of 220lb Type FAB 100 bombs. Newly completed Yak-1 fighters outside the original Yakovlev factory at Klimki, near Moscow, which was hurriedly evacuated in October 1941. Originally intended as the two seat trainer for these fighters, the war situation quickly turned the Yak-7 variant into a fighter which had both better endurance and firepower then the Yak-1. This standard Yak-7B was completed at Novosibirsk during the summer of 1942. Air victory of two Yak-7, which have shot down a German twin-engine plane. State Aircraft Factory at Novosibirsk built more than 15,000 fighters during WW2, mostly Yak-9s. On this picture nearly complete Yak-7Bs of batch no 22 (left) will soon be pulled out of the assembly hall for acceptance flight. Aircraft of batch 23 (right) are in the final assembly stage. 3D model of Yakovlev Yak-7. Frontline pilots considered the rate of fire, endurance and handling characteristics of the Yak-7 to be superior to the Yakovlev 1. The addition of a 22 Imperial gallon fuel tank replacing the instructors seat, provided the Yakovlev 7A with an endurance of 510 miles. The upper decking contours of the two-seat trainer were retained, endowing the single seat Yakovlev 7 with the same distinctive ‘humped’ appearance as the UTI-26. The 772 lb of additional weight resulted in a redesigned and strengthened undercarriage, which featured a one piece undercarriage cover. Relatively few Yakovlev 7As had been built before production was switched to the Yak-7B with a wingspan reduced to 32ft 9.75 in, installation of an RSI-4 radio and a number of aerodynamically refinements which increased the normal load weight to 6,703 lb. The Klimov M-105-PF engine replaced the M-105-PA power plant during the summer 1942, along with the installation of new exhaust stubs, rudder trim tab, and the two machine gun cocking mechanism fairings in front of the windscreen. The Yak-7B fighter supplanted the Yakovlev 1 production from early 1942. The Yakovlev 7 production came in favour for the new Yak-9 to an end in early 1943, 6,399 examples had left the plants of Moscow, Novosibirsk, Omsk and Saratov. Users: Red Air Force of Soviet Union (Russia). Tagged 1942, russia, single-seat fighter, yakovlev.